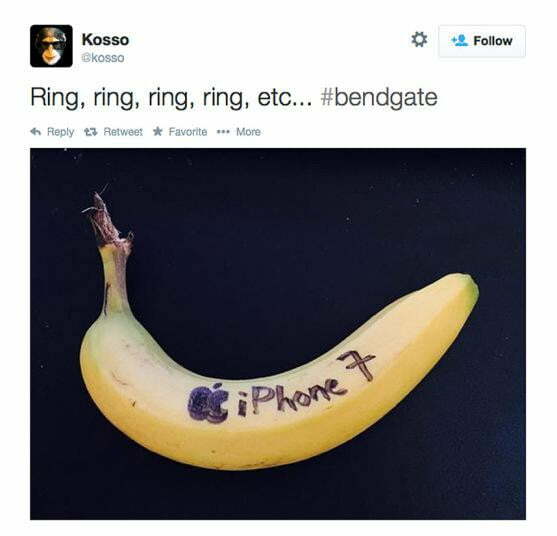 The “scandal” plaguing the launch of the highly-anticipated iPhone 6 launch set the Twittersphere abuzz within seconds of its initial debut. Regardless of where you chose to spend your time on the Web, the Internet became a virtual treasure trove of warped iPhone images exhibiting the hit phenomenon known as — wait for it, wait for it — #BENDGATE. It reportedly began with a single man who discovered his brand-new iPhone 6 was bent upon taking it out of his front pocket, but after explaining the incident on MacRumors‘ forum page, everyone from Samsung to Conan O’Brien decided it was time to address the issue with banner ads and prime-time television. Furthermore, other Apple users quickly responded with their own pictures and tales of bent iPhone 6 models, likely encompassing more than the mere nine people who have reportedly contact Apple directly to complain about the issue. Hell, some design-inclined individuals even took it upon themselves to make some unofficial Apple advertisements and product placement images flaunting the new “feature.” Below are 10 of our favorites, from re-envisioned shots of the Matrix to the forthcoming iPhone 6 Dali edition. Thanks to the Retina HD display, post-modern surrealism has never looked so good. 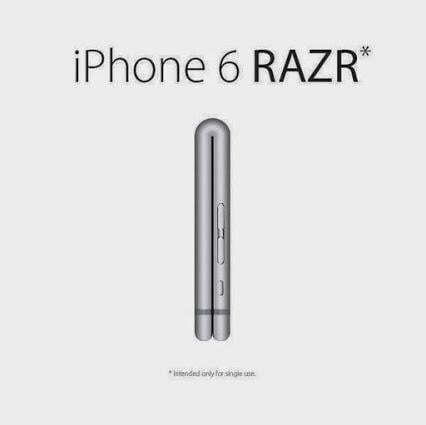 The iPhone 6’s “Bend over” feature is proof some so-called problems can reproduce on their own. Notice the ample space afforded with the additional six degrees of freedom. 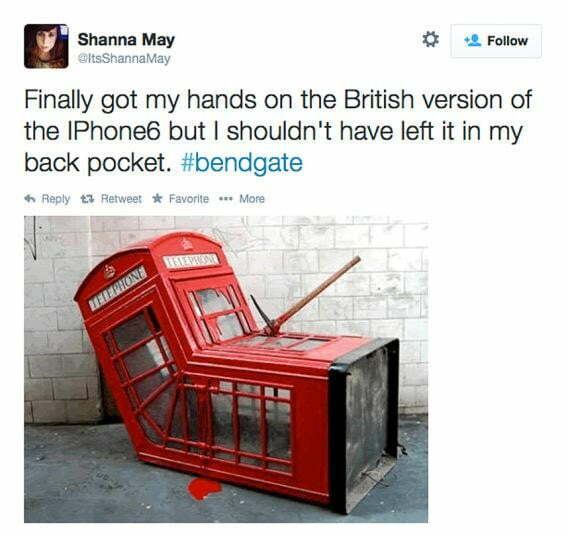 How exactly did Shanna May manage to land the British-exclusive version of the iPhone 6? We’re not entirely sure, but we do know that miniature axe probably hurt like no other when she sat down on the Tube. Suddenly the iPhone 6 is far more ap-peeling. Seriously though, getting your daily dose of potassium rarely comes as easy. Remember that scene in The Matrix when Keanu Reeves — aka the One-and-only Neo — briefly discuses what defines reality with the little boy? Well, the boy was right, there is no spoon. However, there was an iPhone 6. Everyone wants to create an electronic device that provides the ultimate viewing angle regardless of your position in the room. Thankfully, the company’s new Sapphire-Flex displays allow you to adjust the viewing angle however you see fit, whether you’re watching a video from 2 or 20 inches away from your device. The work of iconic painter Salvador Domingo Felipe Jacinto Dalí i Domènech, 1st Marqués de Dalí de Pubol — yes, that’s his full name — has inspired generations of artists and individuals. Given Apple paid a heartfelt tribute to everyone’s favorite rock group from Dublin with a limited-edition iPod in ’04, it’s not surprising the company looked to take its iPhone lineup in a new direction with the release of the iPhone 6 Dali. Now, if only the Louvre was so lucky. Rules are meant to be broken, much like KitKat bars. 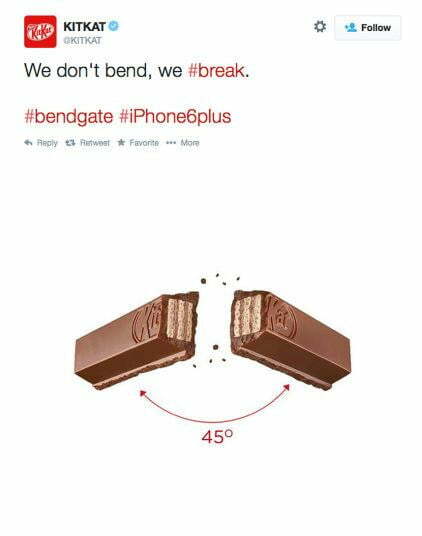 That said, maybe Apple is simply ahead of the curve with BendGate. Bend it like Beckham isn’t just the harrowing story of 18-year-old Punjabi Sikhs and her rise to the top of her London-based soccer league (on the contrary). 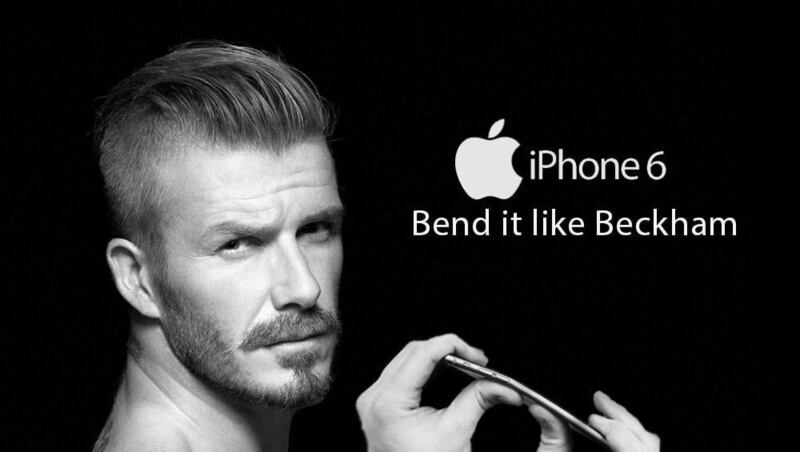 Apparently, it’s also the slogan behind David Beckham’s latest celebrity endorsement for the iPhone 6, one with which not even “got milk” can compete. Call it a throwback or simply a tribute to Motorola’s most iconic cell phone, but Apple looked to capitalize on the mid-2000 appeal of flip phones with iPhone 6 Razr. Digital Trends’ editorial assistant Joe Donovan contributed to this article.